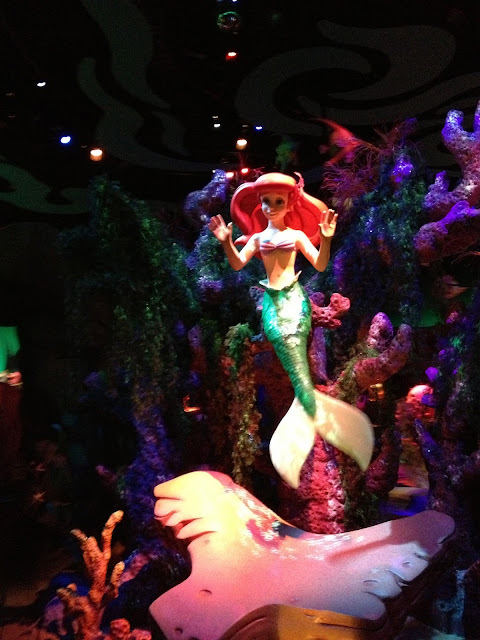 Ariel's Undersea Adventure opened in 2011 at Disney California Adventure. Shortly after it opened I watched a ride through video on YouTube and was immediately wishing I could ride the attraction myself. When I heard Walt Disney World was getting its own in the form of "Under the Sea: Journey of the Little Mermaid", excited doesn't even begin to cover how I felt! 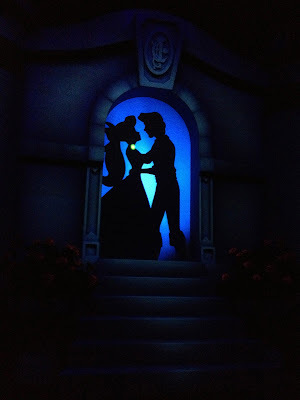 Today's post is for everyone who either loves the attraction and wishes they could ride it again or for those who haven't seen it and want to dream like I did. 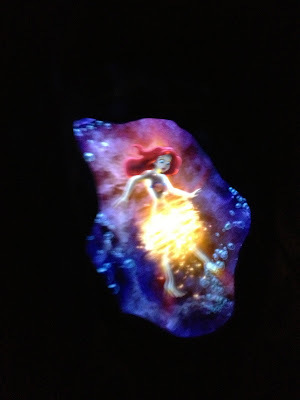 Right after we left Belle's Enchanted Tales, we walked over to Under the Sea: Journey of the Little Mermaid. The wait time wasn't too long. Once we got further in the queue we actually wanted to walk slower than the line was moving! That's the beauty of a ride that loads while in motion: no standing still in line! 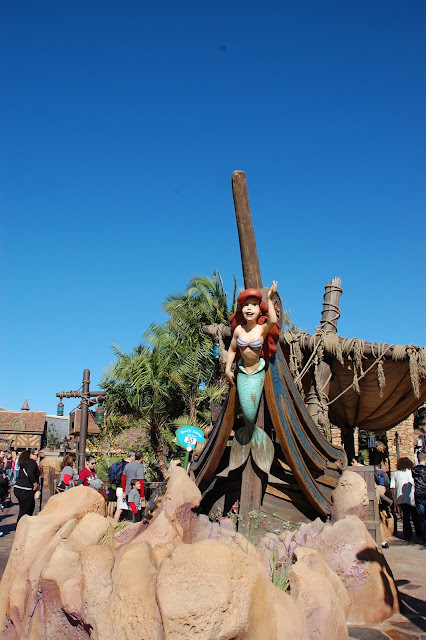 Ariel on the front of Prince Eric's wrecked ship. The outdoor portion of the queue circles around the outside of Prince Eric's Castle. 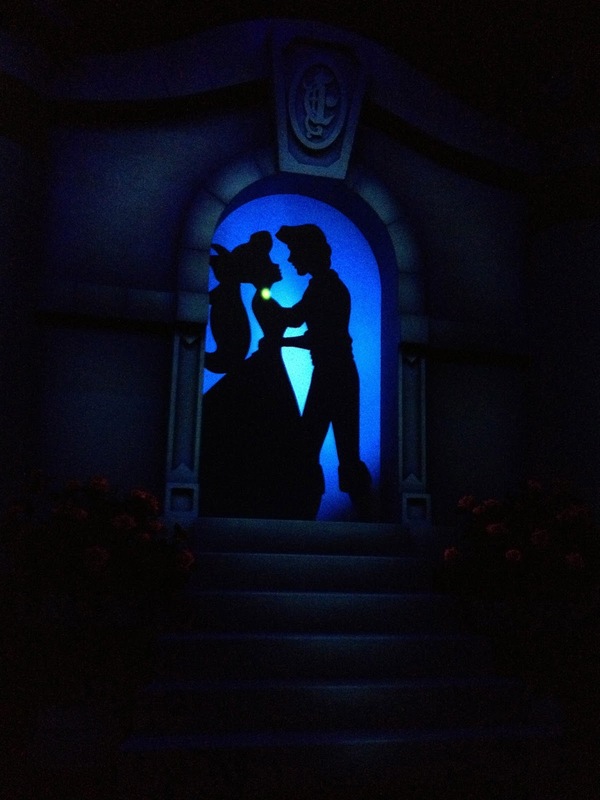 Both The Little Mermaid and Beauty and the Beast are the animated movies of my childhood. I remember watching them both over and over (along with Aladdin), singing along, and dreaming of walking through those castles. While you can't go inside Prince Eric's Castle, the details on the outside are just as I remember them from the movie! Can't you just imagine Prince Eric walking out here & playing his flute? Or Ariel gazing out of the window wishing for her voice? Just like at Maurice's Cottage, the water fountains here blend right in! A portion of the queue is inside. Once inside guests are encouraged to watch for crabs who are playing a game. They'll even interact with guests! Ariel left a sign explaining the game. Windows like these are where you can spot the crabs! Scuttle greets guests going through the queue. The final part of this post is going to take you through some of the highlights of the attraction. Believe it or not, I downgraded cameras for these pics. It's a dark ride, so I didn't want to break the rules and take photos with flash, and the DSLR could not handle the movement to get a photo that wasn't blurry when the flash was off. My iPhone 4S took these pics, and I'm pretty pleased with some of them! Enjoy Ariel's Undersea Adventure with us! Another new to Disney World Castle! As a kid, I always wanted to hang out with this octopus! The Under the Sea portion of the ride had so much to look at! Ariel dancing along until she runs off to find trouble. The Ursula animatronic is all sorts of amazing! Can you spot Sebastian singing Kiss the Girl? Ariel's voice returning makes a heart (not pictured)! This is one of my favorite attractions in Magic Kingdom now. The queue and attraction are both stellar, and it's fun to sing along with all of my favorite songs from one of my all time favorite movies! Join us Friday as we finish Fantasyland, new and old, and I share how we did it "all" by just past lunch! The little mermaid has always been my favourite. I have grown up watching the same. Cute post! Brought back so many memories! I Love Prince Eric's castle! I love this ride! I heard that in the queue there is some kind of tribute to The Nautilus from the old submarine ride. Have you seen it? I don't think I saw it... actually maybe my brother-in-law or sister pointed something out. I can't remember. Now I have something to go back and look for! We also love this ride. We were there for one of the preview weekends and Little Man and I literally rode it 5 times in a row. By the end we didn't even have to circle the queue. They just let us stay on.